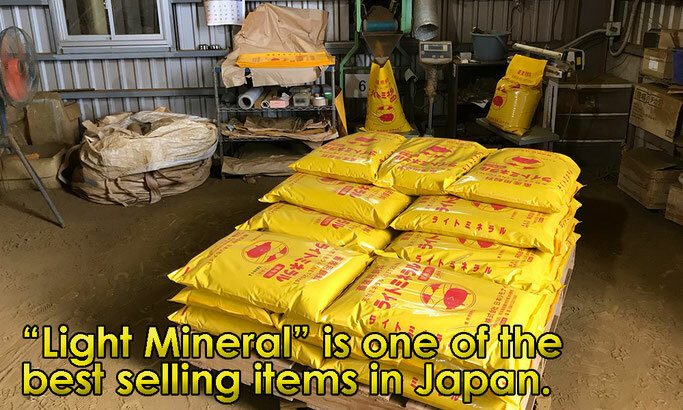 1) Limonite (FeO (OH) nH2O) is a mineral resource that contains iron ore.
2) Aso limonite has been generated for 300,000 years in the area of Aso volcano, located in Kumamoto, Japan. 3) Aso limonite has higher purity and it has been used as an additive in the feed for cow, pig, fish as well as deodorizer, soil exchanger, water purifier. 4) Aso limonite contains rich mineral such as calcium, manganese. It enhances growth of animal, fish, plants. 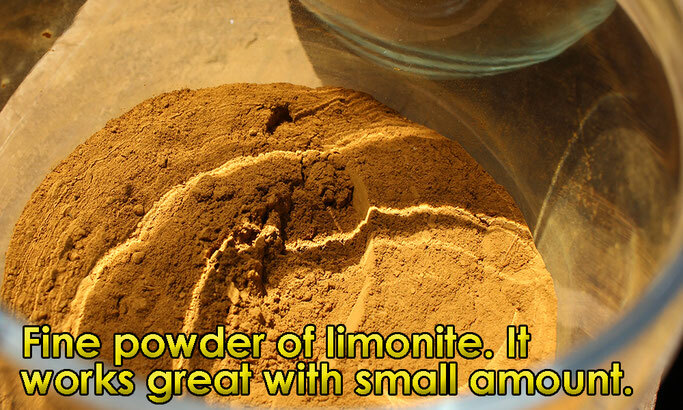 5) Aso limonite absorbs bad smell in the soil and waste water. It is widely used in water treatment plant, factory, livestock farming areas all over Japan. 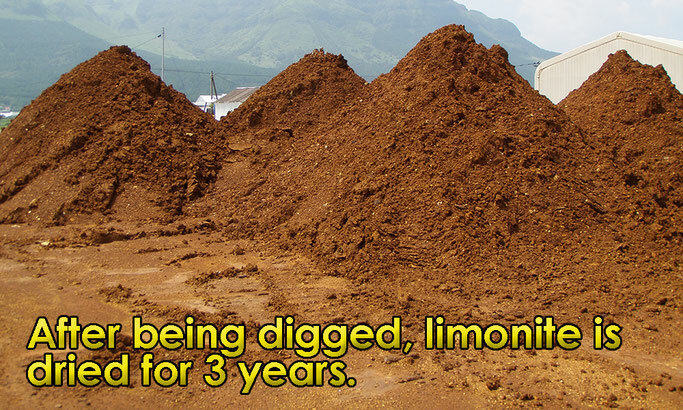 6) When Aso limonite is used as an additive in the food waste, limonite works to decompose waste into compost. 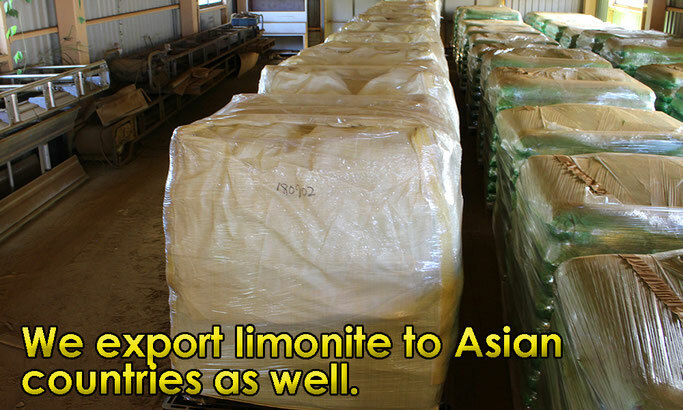 1) Limonite is found in France, Italy and Canada in addition to Japan. However purity and quality of Aso limonite are the highest among all. 2) 70% of Aso limonite consists of iron hydroxide and it contains lots of natural minerals. 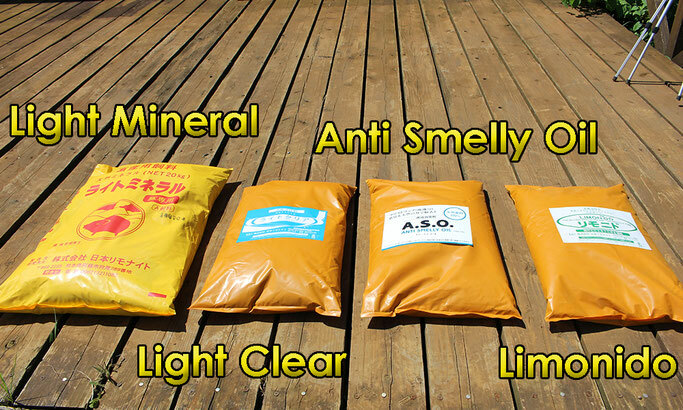 Aso limonite absorbs hydrogen sulfide, phosphorus, ammonia and residual chlorine. 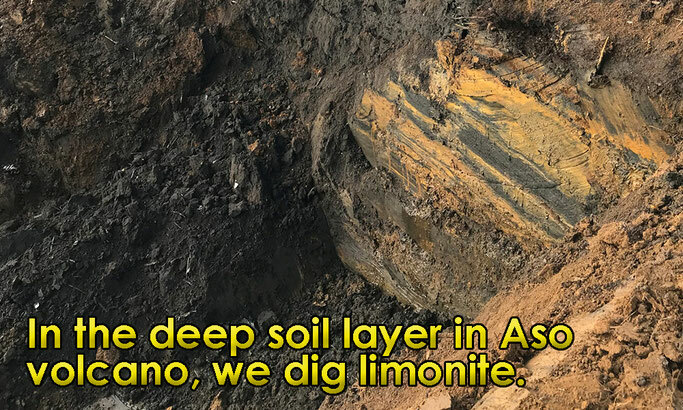 3) Due to good balance of natural minerals, Aso limonite is multi-functional product that can be used as animal feed, health supplement for pet, soil exchanger, deodorizer, water purifier. 4) Aso limonite is dried and aged for 3 years. High absorption performance of gas and hazardous material is another advantage of Aso limonite. 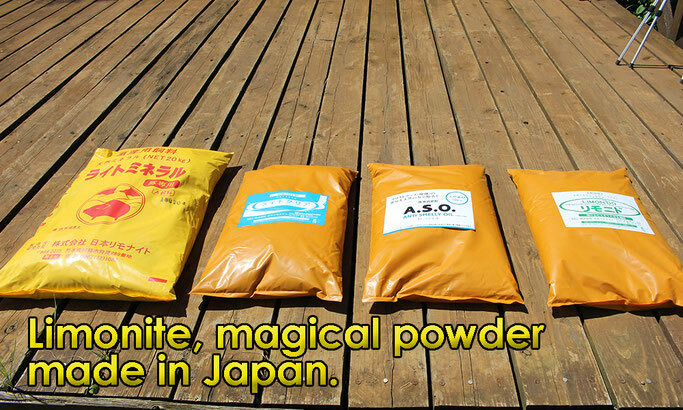 5) Aso limonite is 100% natural animal feed, it is registered and used as "Class A animal feed" in Japan. Especially pig likes limonite. After eating limonite, pig grows faster, safer, bigger and reduces smell from body and wastes. 6) When Aso limonite is used as soil exchanger, it absorbs toxic gas such as hydrogen sulfide and ammonia, and enables root to grow better. Limonite also supplies indispensable micro elements such as magnesium and calcium, you can expect more harvest from your farm. 7) When Aso limonite is used as water purifier in the pond, river, lake, it absorbs excessive phosphorus and supplies necessary minerals. Aso limonite enhances decomposition of algae and increases transparency of water with enhancing activity of bacteria. 8) Not only in water purification, but also in improving water quality, Aso limonite works well. 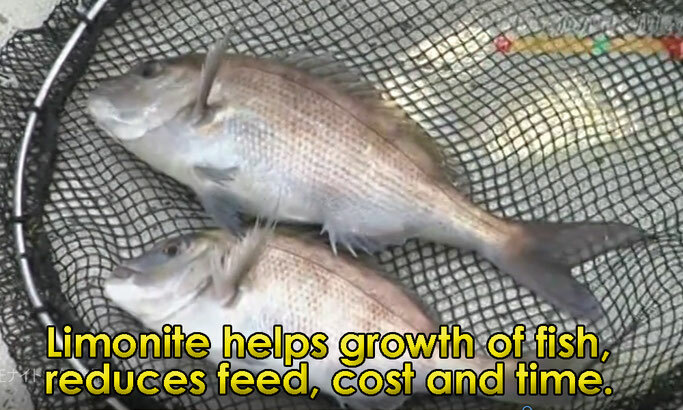 It enhances growth of fish and prawn, reduces disease. * All bags are tied with PP band in 8 points to prevent falling down. - Grease trap : 5kg in 200-400L (Please mix it well to see status of oil in the first use). * After the first usage, please use 100g in each garbage disposal. Garbage is deodorized. * If it's difficult to use 100g every time, please use 300-500g every two weeks of 1 month. 8. Availability of free sample : 100g sample for testing is FREE OF CHARGE. 4. Product liability insurance : Available (valid in Japan). If you need P/L insurance in your country please ask in advance. 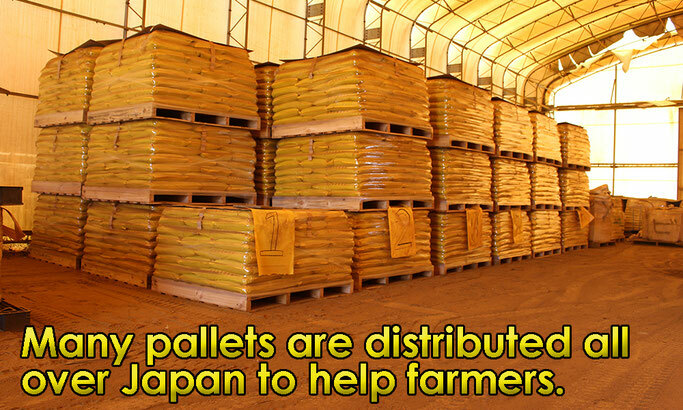 Aso limonite has been used for more than 20 years in Japan, and it has been officially registered in the ministry of agriculture. The safety has been proved in the research by Cornell University of the United States. In Japan the major usage is supplement of iron and mineral. No toxicity has been detected in the test of ophthalmology, haematology and histopathology (repeated oral administration toxicity test with rat for 13 weeks). 1) In the usage for the additive in animal feed, 0.5% in the total volume is recommended. Test has proved that limonite reduced death ratio of pig when used for the mother pig was pregnant. Another test has proved that the weight of pig increased when the baby pig ate limonite for 3 weeks after being born. 2) Too much supply of fertilizer sometimes increases hydrogen sulfide and ammonia, it prevents healthy growth of the root of plant. 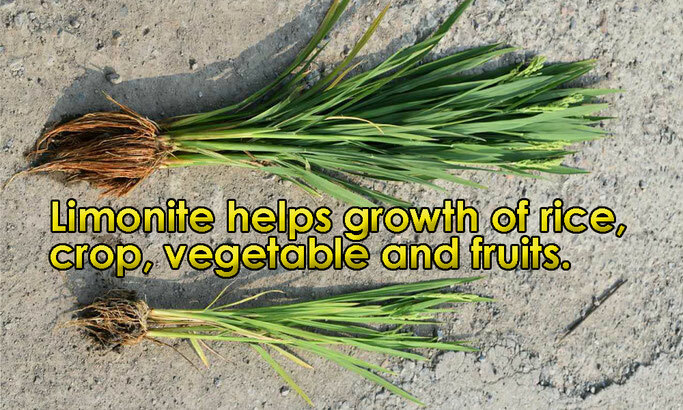 However, if you apply limonite 20-40g per 1 square meter, it absorbs toxic gas and enhances growth of root. It also supplies indispensable micro elements such as magnesium and calcium to the plant, sometimes increases sugar content. 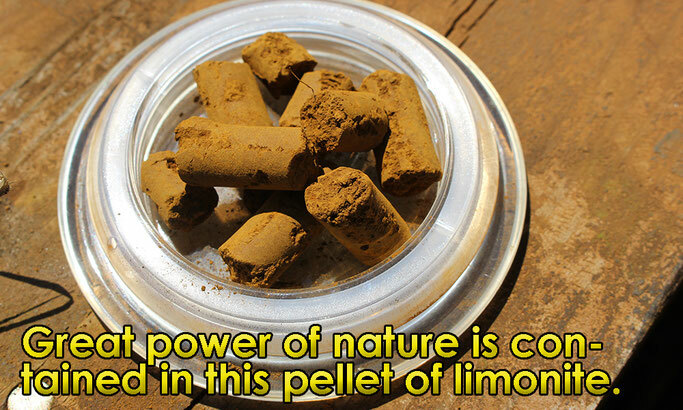 3) If you use limonite in the pond and river where water-bloom spreads bad smell, limonite absorbs phosphorus and prevents growth of water-bloom. It works well in improving water quality. 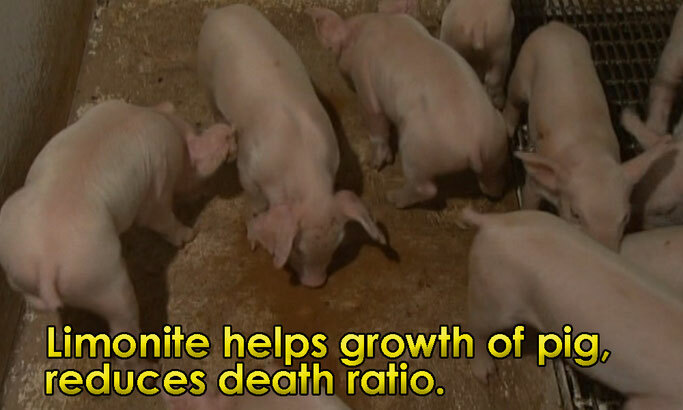 1) Reduction of death ratio of baby pig. 2) Enhance of growth of animal. 3) Increase of weight of baby pig when they ate limonite for 3 weeks after being born. 4) Similar effects in fish, prawn and chicken. 5) Reduction of organ weight of fish. 7) According to the test of prawn farm in Thailand, limonite could reduce 100ppm hydrogen sulfide into 0 in 10 hours. 8) Limonite could increase sugar content 1.03%, sourness 0.18% in a vineyard in Kumamoto. 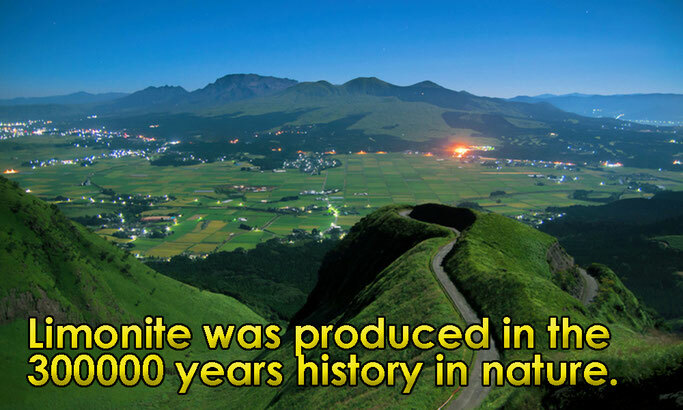 9) According to the test of rice growth in China, limonite enhanced growth of rice and made it taller. The root of rice also got longer and deeper.